Antonella De Ninno was born in Italy. She got her degrees in physics at Rome University in 1984 with a thesis on thermal transport in crystals at very low temperature. 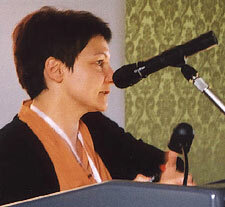 She has been working at ENEA (National Agency For Energy, Environment and Technology) since 1987. She is author of more than 50 scientific papers on Low temperature Physics, Superconductivity, Hydrogen Storage in Metals and, more recently, on interaction between electromagnetic fields and living matter. She has co-authored many papers on the effects of electrical and magnetic fields since 2001.